15 Months...Only one day late! 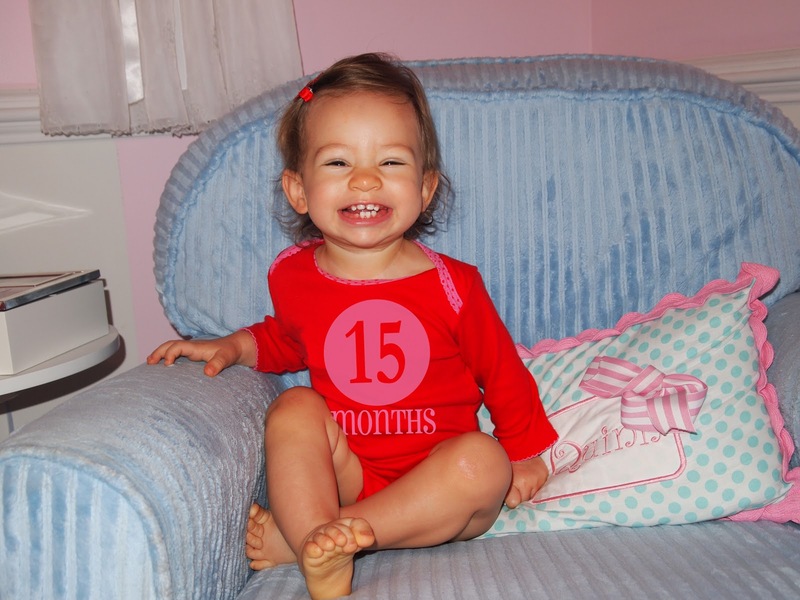 I can't believe my little nugget is 15 months old! More unbelievable than that is that I took her picture on time and am only posting it one day late. I even got to work late this morning. I guess I work well under pressure! Oh Quinny....I don't even know where to begin. You are talking up a storm, you say "Hiiiii!" whenever we walk into the room. You love Olivia (or "Howie" as it comes out of your mouth). You are such a strong little girl whenever you get hurt. But you love putting your little ice pack on your boo boo's! You still have 7 (almost 8) teeth! No molars. You love, love, love giving hugs and kisses. You get ridiculously mad if we take something away from you that you aren't supposed to be playing with. You are the absolute best part of our day. That smile is insanely cute.You are independent, moody and down right feisty and we love every bit of you. And girlfriend, you can EAT. Seriously, you are a never ending pit, especially with your crackers and cheese (which you ask for now). You are an absolute joy. We have Quinny's 15 month appointment today so I am excited to see how big she has gotten! It is still unreal to me that we buy her 18 month clothes. She is just such a grown little girl.....not so much a baby anymore!